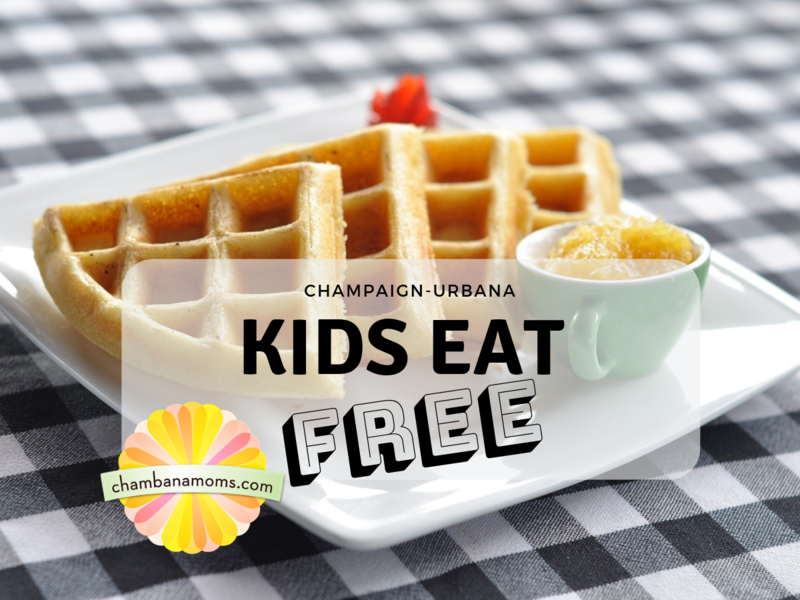 Where kids can eat for free or cheap in Champaign-Urbana. Taking your kids out to eat poses its challenges, but spending a fortune doesn’t have to be one of them. Several places in the Champaign-Urbana area offer kids-eat-free (or cheap) specials. Notice a new deal? Send us your tips (pun intended). While we do our best to keep information current (most as of December 2018), listings are subject to change without notice — and they change frequently. El Toro: Kids eat free. Champaign locations only. Denny’s: Champaign. Kids eat free Tuesdays from 4-10 p.m. 702 W. Town Center Blvd, Champaign. (217) 359-7044. Chili’s: Kids meals are 99 cents every Tuesday for kids 12-and-under all day (open 11 a.m.-10:30 p.m.) with purchase of adult meal. 1905 N. Prospect, Champaign. (217) 398-2161. Fazoli’s: Tuesday’s after 4 p.m. , kids 12 and under eat a kids meal for 99 cents; one for every adult entree purchased. 2029 N. Prospect Ave., Champaign. (217) 356-4820. Texas Roadhouse: Tuesday 4-8 p.m. Free dessert, arts and crafts, games and ice cream sundae bar. Dine in only. 204 N. Country Fair Dr., Champaign. (217) 355-9901. Attie’s Bar & Grill, Urbana: Kids eat free on Wednesdays all day. Get one free kids meal with each paying adult. A kid’s meal includes an entree, side, and drink. 600 S. Stone Creek Blvd., Urbana. (217) 367-9876. Monarch Brewery, Monticello: Kids Meals (under 12) are Free with purchase of a Featur Entree on Wednesdays at Monarch Brewing Company. 212 S. Independence Street, Monticello. Applebee’s: Kids eat free from 4-8 p.m. with an adult entree. Includes an ice cream treat. 12-and-under. Rosati’s: Kids ages 10 and under eat free. One free kids meal with each paying adult, 11 a.m.-8 p.m. Some restrictions apply. Steak ‘n Shake: One free kids’ plate for every $9 spent. 12-and-under. Dine-in only. Saturdays and Sundays. V Picasso: Kids eat free for brunch. 10-and-under. One child per adult. Limited breakfast menu. Moe’s Southwest Grill: Kids eat free all day on Sunday. One free kids’ meal with purchase of an adult entree. 2041 S. Neil St., Champaign. (217) 352-6637. Slim Chickens: Kids eat free all day Sunday. One free kids’ meal with one adult meal. Dine-in only. Pink Pig: Head out to Ogden for some homegrown BBQ and for kids 10 and under eat free with paid adult entree noon-3 p.m. If you have comments or updates, send us an email at editor@chambanamoms.com.